When it feels like the weight of the world is on our shoulders and our heart is heavy burdened because we’re troubled and feel alone, and it seems like the world is against us who can we call on? God. He hears the prayers of the righteous. He’s always with us. One of the most difficult things to contend with is not placing judgment when we are going through something. Even more so, one of the greatest challenges we face when in such a predicament is not holding ourselves accountable. Sadly, people will always and I mean always have an opinion about you. Gossipers will have a field day when you choose not to do what “they” think is best for them and not you. You can never be good enough to do enough to please everyone. Stop trying. Sometimes we have to look beyond our circumstances to find answers when troubled. It’s not people. We’re fighting against the wrong person. We make the mistake of blaming others for our insecurities. It’s not them. It’s the enemy. If we keep looking for answers from others who will validate our need to be right even when we know we are wrong, then we are looking to the wrong person for a solution to the problem. Then we begin to isolate ourselves from the very people who can help us. As believers we already know Satan is a liar and the truth ain’t in him. His greatest desire is to isolate you from everyone, even loved ones to get your attention. He wants nothing more than to keep your mind preoccupied on things you know are not of God. Because he knows your comfort zone and he wants you to stay there to keep you from growing. God desires you grow. But how you can grow if you insist on doing it alone and isolating yourself from the world because you are comfortable. How can you be better if you’re stagnating your own growth? And choose not to change your mindset or way of thinking because you are complacent? How can you do better if you are still doing what’s familiar instead accepting the challenge of becoming better? You can’t be better until you do better. Fear and faith cannot exist at the same time when you know God. Don’t judge unless you be judged. Surround yourself with the right people. Godly wisdom is the greatest wisdom you can ever have to help you when going through the storm. Take a moment. Sit in silence. Seek God. Stop relying on other people to validate your existence. Come out of your comfort zone. Choose to be happy. Choose to live to please God. Be not afraid. God is with you. When you find yourself in a predicament that you have no control of, go to God and not other people. If God be for you, he is more than the world against you. Psalm 27:1 tells us, “The LORD is my light and my salvation; whom shall I fear? the LORD is the strength of my life; of whom shall I be afraid?” No one or nothing! One of the most difficult things to overcome is moving on from tragedies of life that can keep you bound. Let go. Let God. You shall live and not die. Never waste time worrying about what you can’t do nothing about. You will only disappoint yourself. Put it in God’s hands. Let Him handle it. Yesterday was one of the most difficult days I felt I’ve had to face since losing my mother. I accidentally threw away something I felt was my lifeline and couldn’t stop crying. I told God, “My life hasn’t been the same. I feel so alone. I can’t do this. I don’t want to be a Christian anymore!” I vowed I would stop being a Christian as of today. As if it were just that simple. I asked Him “What am I supposed to do now since I can’t pick up the phone to call my mother to pray for me? Who can I call? Who is praying for me?” My daughter said something profound when she told me, “Mom at least you have a back up to what you lost. It could be worse.” I was so distraught I failed to pay attention to what she said. I woke this morning feeling worse as tears flowed like a river and cried to my sister who hugged and comforted me, assuring me everything will be all right. I then begin to ask myself, “Am I a fake Christian? Am I not who I say I truly am because I fall apart? And want to give up at the least distraction even when I work to inspire others? Am I supposed to fake being perfect because that’s what others expect of me? Why do I feel guilty when bad things happen to me? Is it not right to be imperfect, helpless, hurt, or broken?” Am I really a fake Christian? The answers are no and no. I’m not. God does not require I be perfect. In fact he expects the opposite. I’m a Christian who sins in need of a Savior. I’m supposed to be lost, fallible, or broken. Otherwise how can God do his part? How can he put back the broken pieces of my life when I feel helpless because things around me are falling apart? How can he mend my broken heart if it’s never broken? How can he save me if I never need rescue? How can he correct me if I’m a perfect Christian? I can’t be perfect but I can strive to be more like Christ every day. I’m not a fake Christian in no way. Then I realized this is nothing but a trick of the devil. He’s riding my back so hard I couldn’t seem to shake him all night nor this morning. He must know something major is on the way. It tells me my breakthrough is coming! Yes, every day is a struggle but what I’ve come to know, once you give your life to God, there’s never a good reason to stop being a Christian. You may falter and fall by the wayside. You may even lose your faith and fall short. Hebrews 6:4-6 tells me a believer need never worry because he will never lose his salvation. There is nothing we can do to ever make God stop loving us. No matter what we go through, he will be and is always with us. He is the great I AM that I AM. He can do anything but fail. Just because you are a Christian, don’t ever be ashamed of your flaws. 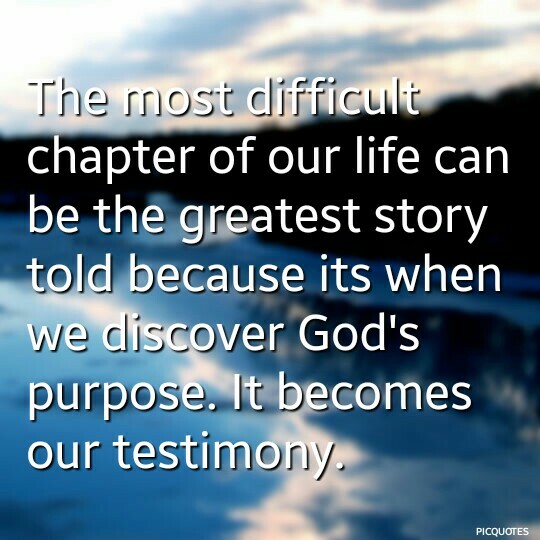 Don’t ever be afraid to proudly share your testimony. God loves us more than we can ever love him, even when we lose sight of him when things are not going well. In times of trouble he is a present help. Faithful is our God. There is nobody greater than our God. Praise the Lord! Make the devil mad today. Serve him notice. Show him your battles scars. Let him know you serve a mighty God. The battle has already been won. No matter what you go through, let him know you will never give up! I’m just a messenger. When God speaks, I listen. I would rather do what God says and have him be pleased at me than to do what others say and have them be mad at me. God does not decide on or pick a particular person to hear a word from him. His word is for anybody who will listen. God has a strange way of revealing something he needs you to know. Because after all, we can never understand why God does what he do or how he does it. His word shall go forth. Every day we can expect a visitation from God. When he comes we have to have our house in order. When your house is not in order with God, neither are you. No matter how right you are in all that you do, your wrong becomes your right because you are choosing to just be you. Just because you may have weathered the storm doesn’t mean you did based on your own merit. But God may have sent the storm to bring something to your attention that he may get the glory out of it. Yes, God blesses us at all times. Yet when we choose to not grow when the storm is over, we miss the more that God has for us. His word says he wants to bless us and bless us more abundantly but he wants us to be obedient. It’s not that he can’t do it but it’s because we won’t let him. Don’t be so religious only to fail at being religious because you lack being spiritual. Change your mindset. It’s one thing to say you’re a Christian and another when your heart is not right with God. God gave us breath. We can’t make ourselves breathe. Just because you are a religious person, being religious doesn’t make you a Christian. Being religious is when we choose to live a life that honors our relationship with God. We rely on His wisdom. We allow his will, and not ours, be done. We are intimately connected to God and our spirit longs for a deeper relationship with Him. We choose to live to please God and not ourselves. Yes we can go to church regularly, we can say our prayers night, day, and all through the day, and we can even worship and praise God with our mouths thanking him for everything. All that is good but…when you choose not to commit to an intimate relationship with God and devote your life to his way of life, you make the mistake of living in vain because you are slowing dying a spiritual death when you choose to live without his intervention. You are a sinner. You are dead to sin. Through faith in Christ, you can be saved and made whole again. “For it is by grace you have been saved, through faith–and this not from yourselves, it is the gift of God–not by works, so that no can boast” (Ephesians 2:8-9). You are spiritually renewed. Admit you need God’s intervention. When you are saved you are born again. The minute you become a Christian, act like one. Isaiah 29:13 tells us, The Lord says: “These people come near to me with their mouth and honor me with their lips, but their hearts are far from me. Their worship of me is made up only of rules taught by men.” We can know a lot about God but not know God personally. “When we claim to honor God while our hearts are far from him, our worship means nothing. It is not enough to study about religion or even to study the Bible. It is not enough to act religious. Our actions and our attitudes must be sincere. If they are not, Isaiah’s words also describe us (Matthew 15:8, 9). There’s a saying “Sticks and stones may break my bones but words will never hurt me.” When I was a kid I used to believe this when people and even those I considered family would pick on me or call me names that would hurt my feelings. As I grew older I found some truth in this but believed in my heart that words can hurt more than sticks and stones and should never be the reason why we consciously inflict pain onto others by saying things that are mean, hurtful or not true. Our decisions, actions, and way of thinking should reflect God’s character so that when people see us they may see Christ in us. And not see in us who we choose to be when people see us. Refusal to see the error in your ways does not excuse the behavior. In fact it only exacerbates it. How many times do you need to know that God is the great I AM THAT I AM? He, not you, will get the glory out of it. Take a personal inventory of your life and check to see if something is missing on the inside. Is there a void? Is there a hole in your heart that you cannot fill? Do you believe something inside your heart is missing? As sincere as your religion may be, it is not enough to meet the needs of your heart or fill what is missing. Admit to yourself, I need God’s intervention. Go to God. Seek him. Say to him, I cannot do this thing called life by myself. Lord I need your help. God can fill the void. Change the error of your ways. Live a life pleasing to God. Live out the Fruit of the Spirit. God will be pleased. When you feel the need for God’s intervention in your life, it is then and only then you come to understand your need of God. 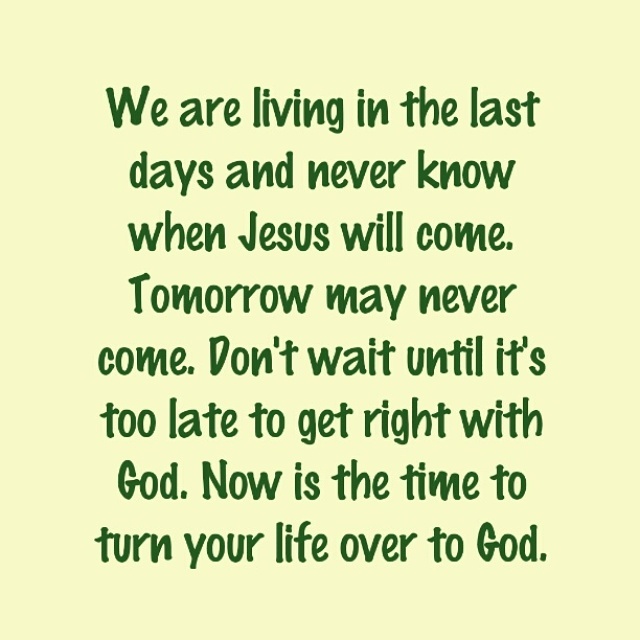 The moment you are born again, your sins are forgiven and you have a relationship with God. You are spiritually renewed. Old things pass away. A spiritual transformation takes place. You are a new creature in Christ. You are no longer who you used to be. Be the person God created you to be. I pray this blesses someone. Matthew 15:8, 9, 11 “These people honor me with their lips, but their hearts are far from me. 9 They worship me in vain; their teachings are but rules taught by men.” 11 “What goes into a man’s mouth does not make him ‘unclean’, but what comes out of his mouth, that is what makes him ‘unclean’ ”. I’m in the Best Relationship Ever! I’m Never Getting a Divorce. I am in Love With Jesus! I’m in an exclusive relationship with the Lord. It is the best relationship I’ve ever had. I am so in love with God. I wouldn’t change it for the world! I’m never getting a divorce. I am in it for eternity. I get to talk to God every day. I can call him on the mainline at any time and his line is never busy. He’s always listening. He doesn’t send me to voicemail when I call or fail to return my calls. He answers my prayers each time I call. I can tell him anything and don’t ever have to worry about him gossiping about, judging, or hating me. I’m his treasured possession (Dt 7:6). He cares for me. What a friend I have in Jesus. He’s my best friend. I am very privileged. God never, ever breaks my heart. When I hurt, he heals my heart. He never makes me cry. When I cry, he wipes every tear away. He fills me with confidence and reassures me, I am worthy. He lets me know, “You are more than a conqueror through Christ Jesus” (Rom 8:37). Yes, Jesus loves me! He knows I’m not perfect. I’m flawed. Yet he still loves me, flaws and all. He never talks bad to or criticizes me. He tells me I’m fearfully and wonderfully made (Ps 139:14). He loves me. I can fail God every day. In spite of me, he grants brand new mercies even when I don’t deserve it. I am so in love with the Lord. This is the best relationship I’ve ever had. I won’t let go. I’m never getting a divorce. No matter what, I will remain loyal. 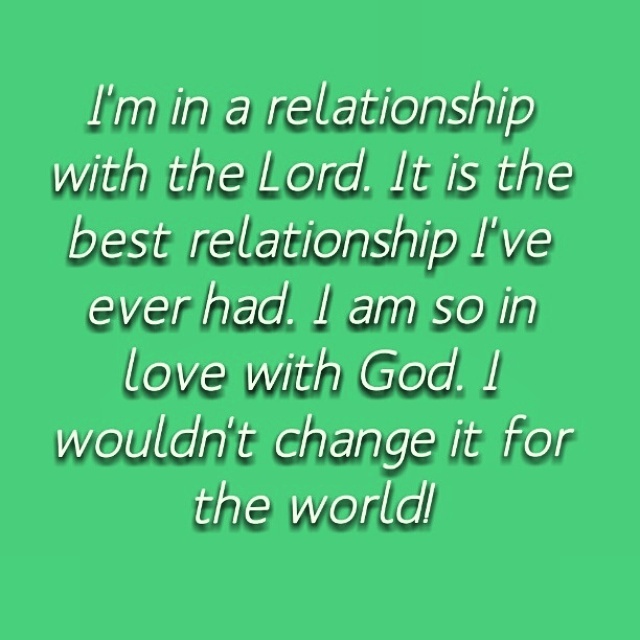 I wouldn’t trade my relationship with God for the world. I am in it for life. I will say yes to him for the rest of my life. Comments Off on I’m in the Best Relationship Ever! I’m Never Getting a Divorce. I am in Love With Jesus! A Reprobate Mind is Not Worth the Trouble. Are You So Heavenly Bound But No Earthly Good? Do You Do What You Ought Not To Do Because It Feels Good? It can be so hard to try and convince people to do the right thing when they are so convinced they are doing the wrong thing right. It’s not your fight. Let go and let God. Let Him do what he does. Mark 12:30 tells us, “Love the Lord your God with all your heart and with all your soul and with all your mind and with all your strength.” Jesus said this is the first and greatest commandment; to love God with all of ourselves. Not half, not a portion, not a piece of, or just some. We are to love him with all of us. One of the most difficult things to understand as a Christian is the actions, thoughts, and words of others who believe somewhere in the back of their minds they are perfect. Not only do they think they are perfect but see nothing wrong with who they are. As such, will refuse to change who they are. To allow yourself to dwell on the actions of others only to become disappointed in their failures, is an epic fail. In reality, you are robbing yourself. Of happiness, joy, and peace. Accept the fact that you can’t change them. People will always disappoint you. Regardless of what they do, you must not let it define you. I know you are saying, “It’s easier said than done.” And when surrounded by extenuating circumstances and forces that are not in your control, it can be hard to handle. That’s when you must let go and let God. Don’t allow the actions of others bring you to the point of self-destruction or do as the evildoer does. God knows best. Do what you can that is in your control and let God handle the rest. God gives us free will to choose the manner which we place priorities and what we value in our lives. When we become so occupied with things and people we believe are priorities, we miss the mark. We manage and continue with our desired lifestyle, but don’t understand we run the risk of developing a reprobate mindset. We live for ourselves. We think contrary of the word of God. 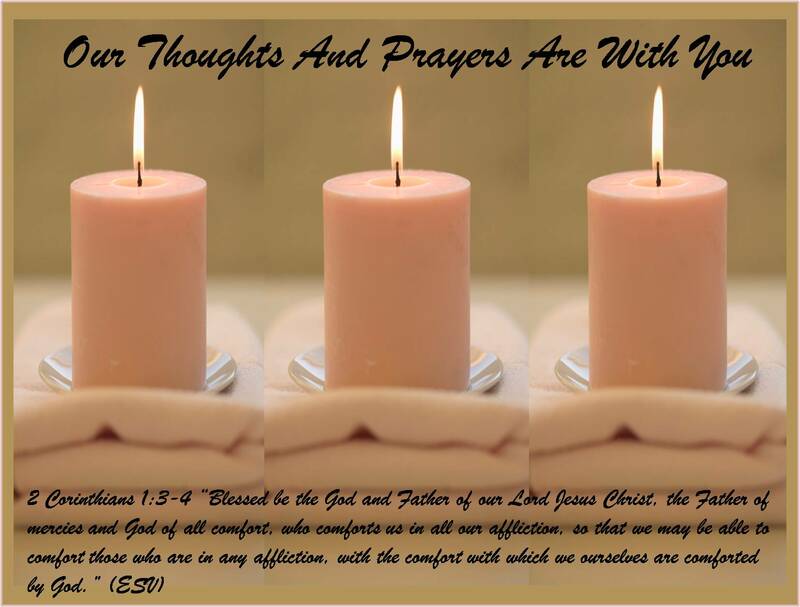 Our thoughts are focused on us and not first and foremost on God. Our thoughts are no longer his thoughts. We stray away from God’s wisdom, knowledge, and his thoughts. We become worldlier and will stunt our spiritual growth. We know the word but choose not to live it, believe it, or even apply it. We are comfortable with half-way or hardly ever, if not never, abiding by it. We are in denial of our own lost identity. Comfortable with just getting by. In our minds, all is well because we have all that WE desire. As long as life is going as we planned, we don’t see anything wrong with us. After all, we still got things and will do that which pleases us. We have a job, a place to live, food to eat, clothes on our back, and shoes on our feet. Not realizing it’s not because of us. It’s because of God’s unmerited grace and mercy even when we don’t deserve it. His grace saves us. There is not a person on earth who will not experience hardship, loss, or a change in their lifestyle at some point in their life that will be beyond their control. It’s inevitable. But what will be the most difficult thing to understand is how to handle it when it does happen. All you can do is pray until something happens. When jobs, people, material things, and anything but God becomes a priority, that thing becomes a form of idolatry. And believe it or not, there will be consequences when you idolize what you’ve made a priority. Oftentimes, when God disciplines us and we don’t like it, we are convinced he got it all wrong. We refuse to see the error of our ways and believe the correction was clearly not meant for us. But you see, when you live a life filled with confusion, chaos, and conflict, without ever thinking something needs to change, you fail to recognize the power of God, and that something will change. You may go about your way doing the same things, finding some form of normalcy because everything continues to go as planned. But trust me, at some point it will all change. In any circumstance, God will see to it that you change. No matter what people do or how they may disappoint me, I will always believe there is some good in each of us. But what I struggle with is how we profess to know God, love God, trust God, yet we deny our privilege when we fail to please him. We fail to show him what we profess. Instead we live a life in denial of what’s not right because of our own countenance. 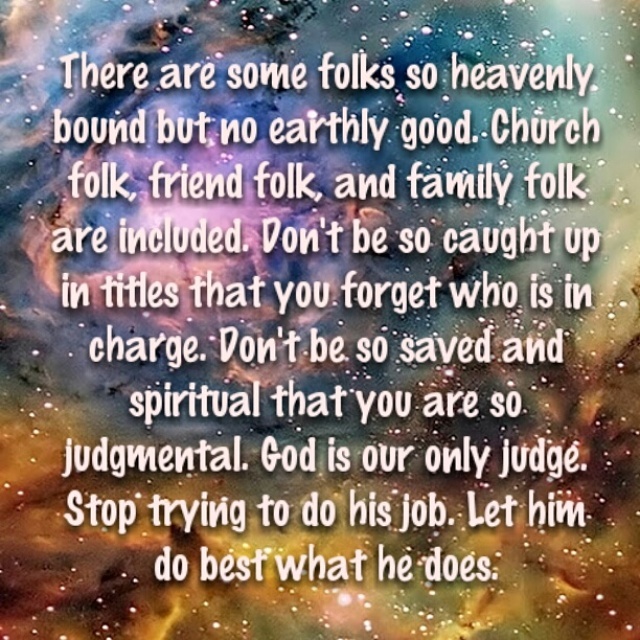 There are some folks so heavenly bound but no earthly good. Church folk, friend folk, and family folk are included. Don’t be so caught up in titles that you forget who is in charge. Don’t be so saved and spiritual that you are so judgmental. God is our only judge. Stop trying to do his job. Let him do best what he does. Let people do what they do. Give it to God. He will do exactly what he promised in his word. Don’t allow yourself to be so far removed from the promises of God that you develop a reprobate mindset. Look to God. Stay focused. Remind yourself of God’s knowledge, wisdom, and his thoughts. Develop the mind of Christ Jesus. We must learn to accept the fact that we can never do what God knows best. We can’t change people. God can. They also have to want to change themselves. They have to one day want to face the truth about themselves. Change your mindset. A reprobate mind isn’t worth the trouble. “For the wrath of God is revealed from heaven against all ungodliness and unrighteousness of men, who by their unrighteousness suppress the truth” (Romans 1:18). In all you do, get an understanding. Actions of a reprobate mind will lead to unfavorable consequences. Be intentional. Find the good in any and everything. Use it to lift up the kingdom. Let the word of God rule your thoughts, actions, and decisions. And if you are not sure about what to do, do what you know will please Him. Search your heart. Seek the action that will demonstrate love for God and love for others. Love as God loves others. Do what you know should be done, and not what you know ought not to be done. 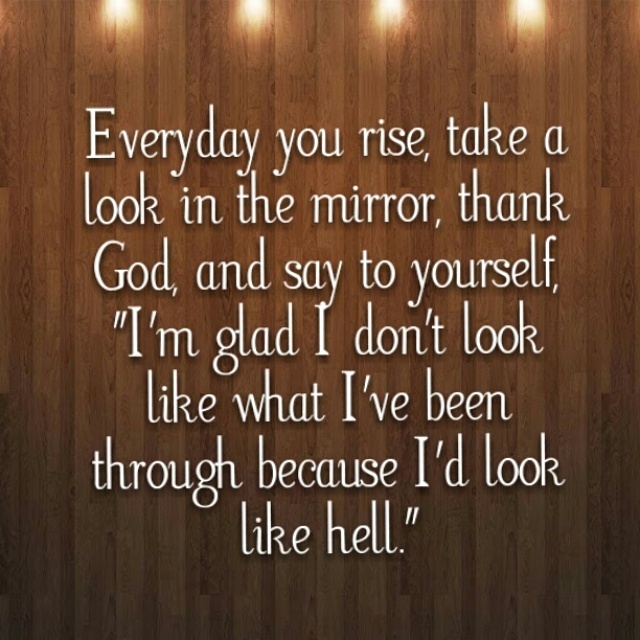 Aren’t You Glad You Don’t Look Like What You’ve Been Through? I Am! Glory Hallelu! When you meet with new trials and it seems difficult, remember how good God has been to you. He’s able. God’s faithfulness will sustain you. Be bold in your prayers. Come to God with audacious faith. Don’t let one circumstance stop your praise. Trust God. Life will be worth living. Growth is a process. It doesn’t happen on its own. You must be willing to change. Not just you but your mindset and attitude has to change too. When surrounded by chaos, confusion and you can’t see the forest for the trees, keep your mind stayed on Jesus. He’ll keep you in perfect peace. The favor of God is on you. He anointed and appointed you. You’ve been tried and tested. Approved by God. Rejoice! It’s your season of elevation. Comments Off on Aren’t You Glad You Don’t Look Like What You’ve Been Through? I Am! Glory Hallelu! I Finally Found the Secret to Joy – My Joy Comes From the Lord! Happiness is based on external situations or circumstances. It’s temporary. Joy is internal and deeply rooted. It is based on God’s presence within us. It is lasting. When the enemy comes to kill, steal, and destroy, reverse the curse! Don’t let him take your joy. Tell him he can’t have it. God gave it to you. Tell him find someone else to pick on! Oftentimes the secret to joy can be found easily. It’s when we allow circumstances or people influence our thoughts that makes it difficult, causing us to believe we can never be happy. Live and let live. That’s what I always say. Because when others are miserable or unhappy, they seek to make you feel the same miserable way. Understand God has a future for you. Find joy. Don’t let the negative opinions of others steal your joy. There are times we will go through what seems unbearable and feel our situation is much worse than others. And believe they don’t understand none of what we’re facing. We will say, “But you don’t know what I’ve been through.” If you took a moment and really thought about it, imagine what some in the Bible went through. You will find it was much worse than what you could ever go through. In Galatians 6:17 Paul tells us, “Finally, let no one cause me trouble, for I bear on my body the marks of Jesus.” Paul suffered, went through worse, and was covered in scars. He was beaten, robbed, betrayed, and mocked by most of the world. 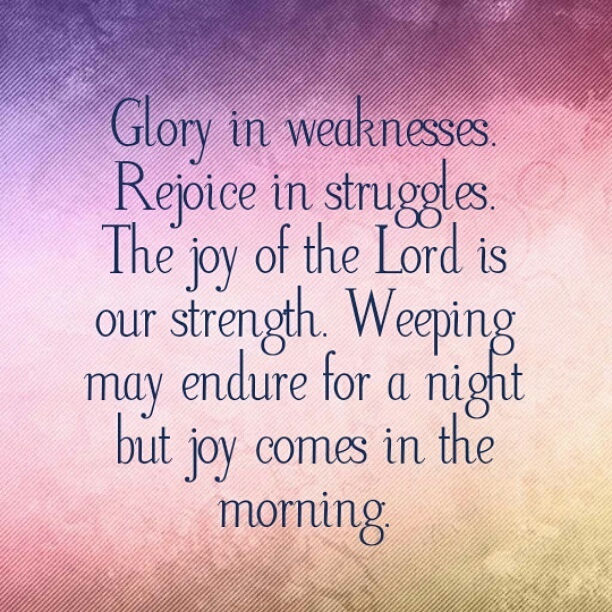 Yet, he still rejoiced in the Lord. Paul had a cause for joy. He had been counted worthy to suffer for Christ. How about you? Can you rejoice no matter what the enemy may do to hurt, harm, or destroy you? Jesus was crucified. He was mocked too. He was forced to wear a crown of thorns and bled from the thorns he wore on his head. That didn’t stop him from fulfilling the purpose God intended. In fact, the crown of thorns worked opposite of the mockery the Roman soldiers intended. It was a great symbol of who Jesus is and what he came to accomplish. He was nailed to the cross and died for us. He died for our sake. If Christ could die on the cross and take the punishment we deserved, why can’t we, just as Paul, suffer for His sake? If Jesus had no problem sacrificing his life for our sins, why can’t we sacrifice our selfish desires for him and rejoice when we suffer? As for me, I finally found the secret to joy. It’s not based on what I have, my circumstances, or what I’ve managed to overcome because of what I’ve been through. My joy comes from the Lord. I’ve learned no matter what circumstance I face, I will rejoice in the Lord. In spite of my troubles, I give glory to God for all that I have been through. God will get the glory. Because had it not been for my troubles, I would have no reason to praise him. Every day I count my blessings, one by one. I thank God for all he’s done. This journey I’ve traveled may not have been the best at times, especially when I wanted to give up. I may have cried for a little while, but when I look back over my life I am amazed God brought me this far. I have no regrets. 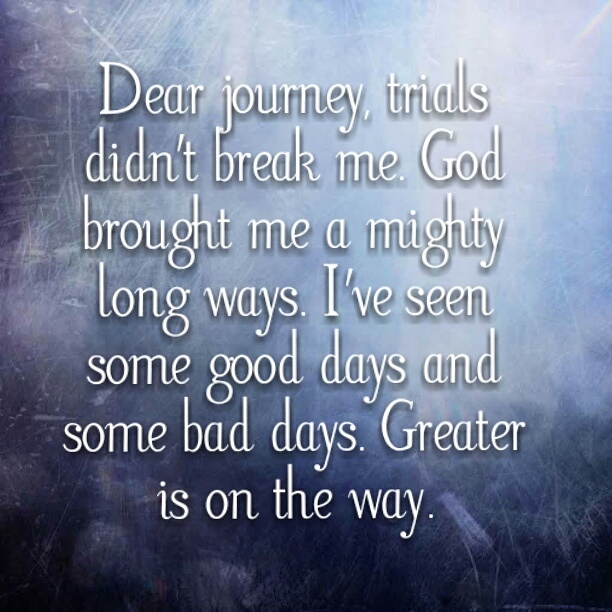 I am thankful for each trial, tribulation and setback. Because it was a setback for my comeback. Don’t let circumstances or people define you. Let your heart be glad. Feel joy. God gave it to you. When you have the presence of God within you, you have found the secret to joy. Praise God in advance for all the things he is going to do, will do, and has done. Praise him for the things he didn’t do. He knew what was best for you. In spite of your deepest troubles, know that you can feel joy. Don’t look to the right or to the left. Look to God. Count it all joy! Comments Off on I Finally Found the Secret to Joy – My Joy Comes From the Lord! Thank you for remaining faithful to me when I ignored your promises. When I doubted you, you never left me. When I disregarded you, you loved me anyway. Thank you for letting me stay. You granted brand new mercies, even when I didn’t deserve it. Jesus came that we may have life, and have it more abundantly. He’s able to do exceedingly, abundantly. The devil won’t win. It is finished. God is good! Checked my balance on my mercy card today. God filled it with increase, overflow, brand new grace and mercy. I got the victory! Dear devil, thank you for every attack you sent to destroy me. You don’t know what you did for me. 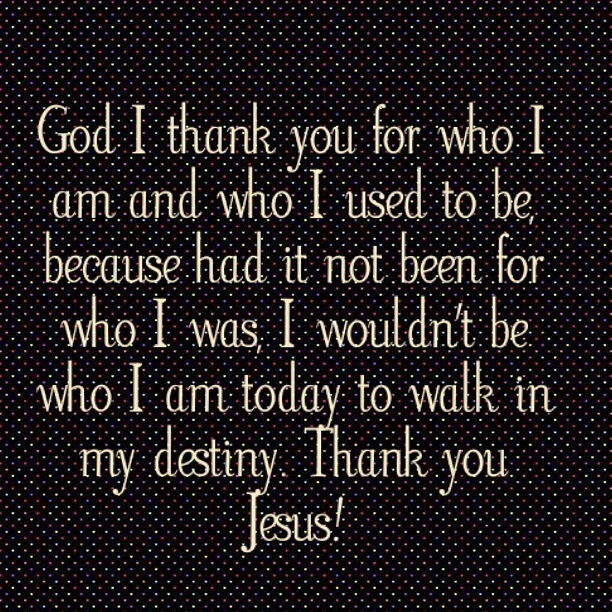 It brought me to my knees, thanking Jesus! Had it not been for the Lord on my side, I don’t know where I would be. Thank you Lord for never leaving me and always being with me. 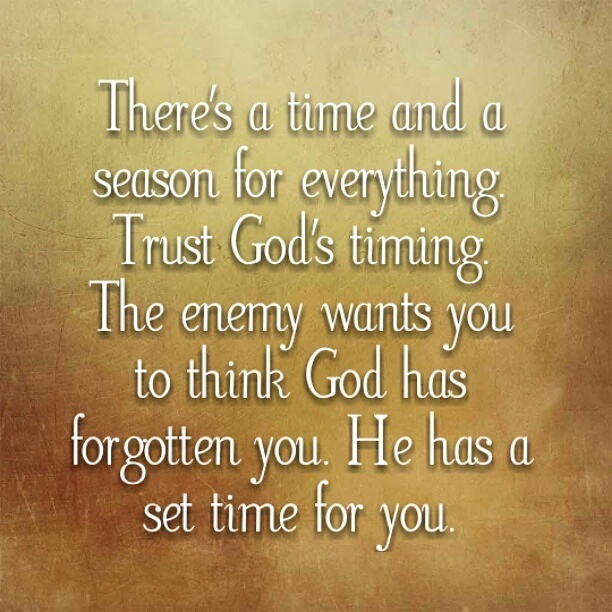 There is a time and a season for everything. God has a set plan for your life. There is an appointed time. Everything will work as he planned, in his timing. God has not forgotten you. He will never forsake you. Keep the faith. Don’t give up. God has a great plan for your life! Have You Checked Your Spiritual Condition Lately? Did you know you can have a relationship with God that will last forever? God loves you. Isn’t that great news! His mercy endures forever. How are you connected to God on a daily basis? What are you doing to maintain your spiritual condition? Are you where you want to be in your relationship with God? When’s the last time you checked your spiritual condition? Having a personal relationship with God is not as difficult to find as you think. It really is simple. There’s no mystery to finding it. Here’s a small bit of advice to guide and help you maintain your spiritual condition. Take these simple words with you that will make a difference. Include God in your daily life, pray throughout the day. Pray without ceasing, read the Word, attend Bible study, and meditate. Get to know him better every day. These things will help you grow spiritually. Relationships formed on earth are temporary and do not last forever. When you place your trust in Jesus Christ, accept Christ as your Lord and Savior, and ask forgiveness of your sins. You establish a personal relationship with God and have an eternal home in heaven. Believe it or not, we all suffer with a heart condition. And at times, it can go unattended. We all have a heart condition that needs to be checked constantly. Have you checked your spiritual condition lately? 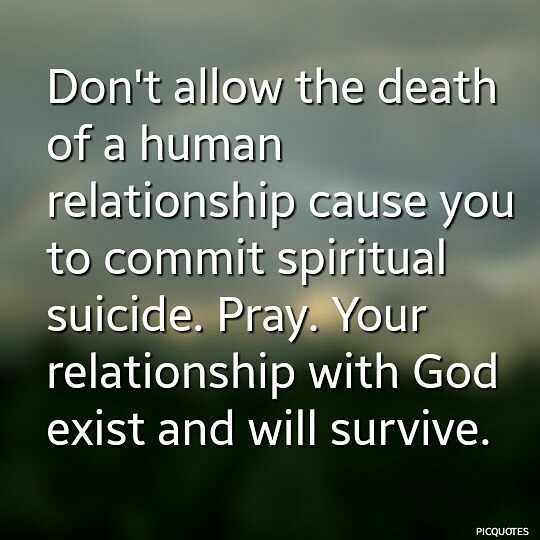 Don’t allow the death of a human relationship cause you to commit spiritual suicide. Pray. Your relationship with God exist and will survive. Comments Off on Have You Checked Your Spiritual Condition Lately? When we become too comfortable, we become complacent. And may find ourselves losing our voice and our identity. We also will lose focus and take our eyes off God. And will try to work things out ourselves. When faced with adversity, at times, we find ourselves looking for answers to things we don’t understand. We create logic that makes sense to us and will follow our own plan. And when it doesn’t work out like we want, we blame everyone else; even God. Sometimes we do things out of desperation because we want immediate results and if it doesn’t work out, we blame God when we suffer. Take this simple word of advice, wait on God. It will work for the greater good. 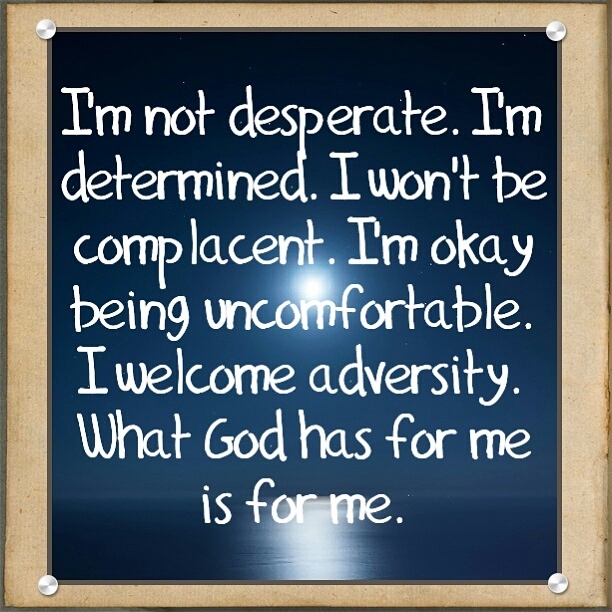 As for me, I’m not desperate, I’m determined. I won’t be complacent. I’m okay with being uncomfortable. I welcome adversity. What God has for me is for me. It seemed nothing was going in my favor that day. I felt defeated, lost, and couldn’t see God in anything. I found myself complaining about the things I didn’t have. Telling God how sick and tired I was of being sick and tired because I lost the things I once had. Bitterness began to set in. I started reflecting on things from my past and began to blame others for my plight just because nothing that day seemed to be turning out right. It was not until I was reminded of Job and in some way, felt the same as he did and began comparing myself to him. Even though I managed to leave out some things, I realized Job was a great example to follow. Job lost everything. His family and possessions. He was at a crossroad in his faith. He started complaining. He allowed his desire to understand why he was suffering overwhelm him, causing him to question God. Yet he remained faithful, had patience, and endurance. He could have either cursed God and gave up. But he didn’t. He trusted God and drew from his strength to continue. He didn’t give up on God. He worshipped God alone. He may have questioned God and was not sure why he was suffering because he clearly felt he did not do anything to deserve such punishment. As did I. I questioned “Why me?” “Why me God?” You know the things I need and don’t have. Why am I struggling? I told him, something changed. I find that the things I used to love doing and looked forward to every day are now becoming extinct. Does that mean I’m growing? I’ve become bored with what used to bring me joy and feel it’s time to move on to something bigger and better. Does it mean you are calling me God to move to the next level? See, I don’t know and now I find I’m truly uncomfortable. I’m struggling. At times I feel I don’t have strength to do what has been so simple for me. Yet I’m no longer satisfied with just doing something. I desire to do more with the gifts God has given me. Pray for me. It’s not that I don’t want to keep doing what I do. It’s just that I want to do something more than what I’m doing. I had to get myself together and collect my thoughts. I rose out of bed. I sat on the edge as I began to talk to God and express my frustration and fears. I told him about the things I’m struggling with. And as I’m talking something came to me. God revealed something incredible to me. I realized no matter how much I read the word, study, and meditate, there was something missing in my walk. 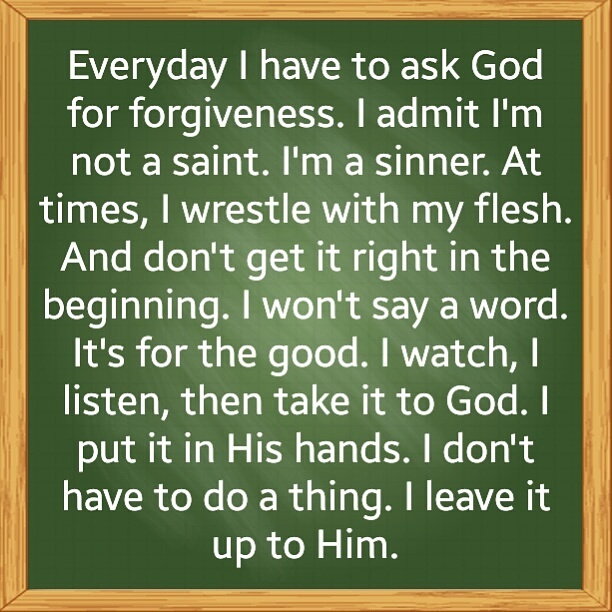 I began to repent and confess my wrongs to God. I knew in the end this would shape me for service to others. John 14:16 tells me, “And I will ask the Father, and he will give you another Helper, to be with you forever.” This assures me the Holy Spirit is on my side. It is working for and with me. I will live as God wants and build God’s kingdom. 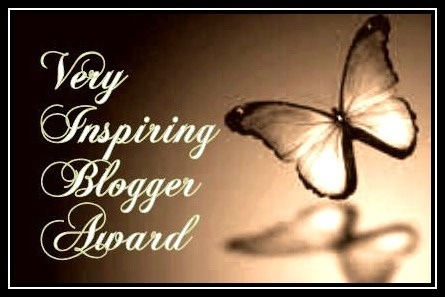 I will never stop spreading words of encouragement, inspiration, or the love of God. I just feel deep inside I need to be doing more. Pray for me as I pray for myself. Search me, God, and know my heart; test me and know my anxious thoughts (Psalm 139:23). Search for sin and please point out things I’m not doing right. Show me any and all wrong motives that may be behind the things I’m feeling. When you show me what I’ve done, I will repent and seek forgiveness. I will walk in your ways. I am forgiven. There’s a struggle inside each of us. There’s someone fighting a battle somewhere much harder than any of us. Pray. God will keep watch over us. Every day I have to ask God for forgiveness. I admit I’m not a saint. I’m a sinner. At times, I wrestle with my flesh. And don’t get it right in the beginning. I won’t say a word. It’s for the good. I watch, I listen, then take it to God. I put it in his hands. I don’t have to do a thing. I leave it up to Him. When you listen to the words of this song, you will see that it clearly sends a powerful message to the things we are seeing in the world today; racial injustice, violence, inequality. The nation is divided, the stigma of racism still resonates. It is still prevalent. Domestic abuse and violence is ever-increasing. Please stop the violence. Be the change you want to see. Don’t let the color of skin infuse hatred and inequality. We should all be treated as equals. We may look different, but the same blood runs through our veins. We all bleed the same blood. The color doesn’t change. God is no respecter of persons (Acts 10:34). In His eyes we are all equal. Jesus Christ doesn’t change. “Jesus Christ is the same yesterday and today and forever” (Hebrews 13:8). God loves each and every one of us the same. Love your brothers and sisters just as he does. I’m not the color of my skin. I may look different but I’m a human being. I’ve said this before and I’ll say it again, “Color has no barrier, no body, or no face. We mustn’t let the color of our skin be the cause of division or hate. We should love one another as God loves us. “It may seem like we have come a long ways in the fight for justice, peace, equality, and in our efforts to end racism. But sadly, we still have a long ways to go. It is far from over but I’m hopeful. Take these words with you from Dr. Martin Luther King, Jr. that I am sharing again today. Pray with me and pray with KaLeo. Pray for the nation. Pray for peace, justice, strength, and comfort in the wake of what we see happening not just today, but pray without ceasing every day. “I refuse to accept the view that mankind is so tragically bound to the starless midnight of racism and war that the bright daybreak of peace and brotherhood can never become a reality… I believe that unarmed truth and unconditional love will have the final word.” -Martin Luther King, Jr.
Here’s a Little Morning Glory To Start Your Day. Be Blessed. Make It a Great Day! Life can be difficult. Every day is s struggle. Count it all joy. God is merciful. God grants brand new mercies every day. Each morning you rise to see the sun rise, you are a witness to his mercy and goodness. Praise God. He’s worthy. Be thankful. God never promised our lives would be easy. But he promised he will never leave us or forsake us. No matter what you go through, it all will be worth it. 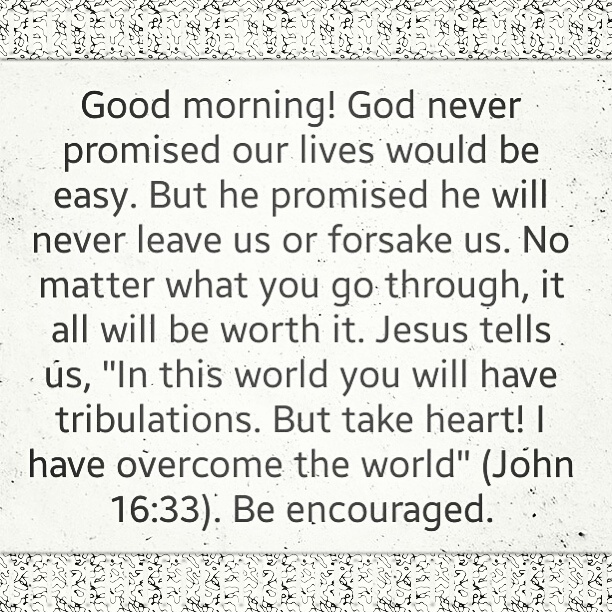 Jesus tells us in John 16:33, “In this world you will have tribulations. But take heart! I have overcome the world.” Be encouraged. I’m reminded of an old song I used to hear my great-grandmother and mother sing and I sang too, and woke with it etched in my heart so I thought I’d share a verse with you. “We are soldiers in the army. We have to fight, although we have to cry. We have to hold up the blood stained banner. 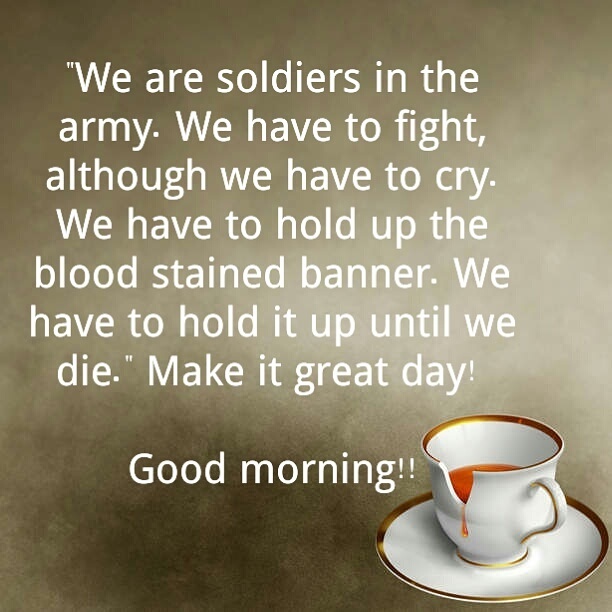 We have to hold it up until we die.” Make it a great day! I thought of you today. Here’s a little morning glory to start your day. Enjoy and cherish each moment. Romans 8:28-31 “28 And we know that for those who love God all things work together for good, for those who are called according to his purpose. 29 For those whom he foreknew he also predestined to be conformed to the image of his Son, in order that he might be the firstborn among many brothers. 30 And those whom he predestined he also called, and those whom he called he also justified, and those whom he justified he also glorified. 31 What then shall we say to these things? If God is for us, who can be against us? Comments Off on Here’s a Little Morning Glory To Start Your Day. Be Blessed. Make It a Great Day! Don’t Complain to God How Big Your Problems Are – Start Telling Your Problems How Big Your God Is! Everyone has problems. None of us are exempt. Many of us will complain more than we should, when we should be thanking God more, no matter the problem. Thank God for what he has done. He’s done more than enough. He brought you through the storm even when you thought the rain wouldn’t stop. God kept food on the table, a roof over your head, clothes on your back, and shoes on your feet. He met every need. You may not have what you think is enough. In his provision, God gave you more than enough. You’re still standing. 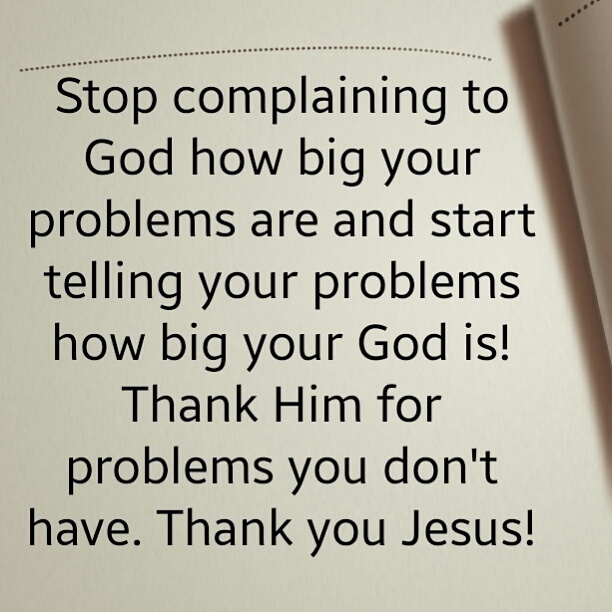 Stop complaining to God how big your problems are and start telling your problems how big your God is! Thank Him for problems you don’t have. Thank you Jesus!